Alex Hassan's two-run RBI double in the bottom of the first gave the PawSox an early 2-0 advantage. In the third, Pawtucket expanded their lead to 5-0 on an RBI single from Mitch Maier and a two-run home run off the bat of Brandon Snyder. Buffalo finally got to Wright in the eighth by plating a run and got a two-run home run from old friend Mauro Gomez in the ninth off of Chris Martin. The Bisons rally was put to a screeching halt, though, as Martin induced a game-ending double play. Jonathan Diaz and Dan Butler each had two hits to lead the PawSox offense. A solid start by Drake Britton and a big day at the plate for Peter Hissey propelled the Sea Dogs to a 7-4 victory over the Akron Aeros (CLE). Britton hurled seven innings, surrendering two runs (one earned) on five hits and three walks. Miguel Celestino tossed two innings of relief, allowing two runs on four hits, while striking out two. Like their Triple-A counterparts, Portland also got off to a quick start offensively, plating two runs in the first on a Michael Almanzar RBI double. In the fourth, a Kolbrin Vitek RBI single and a run-scoring fielder's choice from Heiker Meneses gave the Sea Dogs a 4-0 advantage. After Akron got on the board in the top of the fifth, Hissey led off the bottom half of the inning with his first home run of the season. The Sea Dogs right fielder followed up with an RBI single in the sixth, as his team took a 7-1 lead. Akron chipped away for one run in the seventh and two in the eighth, but did not muster a serious comeback. Hissey was 3 for 5 with a home run, two runs scored and two RBI to lead the Portland offense. In game one of a doubleheader, Salem's bullpen proved to be a huge letdown, as the Lynchburg Hillcats (ATL) came back for a 6-5 victory in eight innings. Henry Owens received the start for the Red Sox, hurling 4 1/3 innings, while allowing two runs on five hits and three walks to go along with seven strikeouts. Nate Striz allowed a run on two walks and no hits in 1 2/3 innings of relief. Nefi Ogando picked up the loss for his two innings of relief, giving up three runs (two earned) on four hits and a walk. Down 1-0 in the second, Salem took a 2-1 lead on David Renfroe's RBI double. Bryan Johns' RBI single in the fourth plated two more runs, giving the Red Sox a 4-1 advantage. Lynchburg chipped away at the lead, plating a run in the fifth, sixth and seventh innings before finally grabbing the lead with two runs in the top of the eighth. The Red Sox rallied in the bottom half of the eighth, bringing home a run on Henry Ramos' RBI single. However, Renfroe would end up grounding out to end the game, stranding a runner on third. Game two proved to be a much easier affair for the Red Sox, as they toppled the Hillcats 4-1 in seven innings. William Cuevas picked up his third victory of the season, hurling six innings, while allowing one run on five hits and two walks. Noe Ramirez pitched a 1-2-3 seventh to pick up his first career save. Brandon Jacobs' two-run home run in the first inning gave Salem an early 2-0 advantage. Leading 2-1 in the sixth, a Felix Sanchez RBI double and a run-scoring error provided the Red Sox with some extra insurance. After struggling through most of the first half, Jacobs is hitting .261/.382/.478 with two home runs and nine RBI thus far in June. Greenville put up little fight in its 8-0 loss to the Savannah Sand Gnats (NYM), mustering just five hits. Cody Kukuk dropped to 3-7, as he allowed two runs on one hit and six walks in 3 2/3 innings of work. Francisco Taveras added three innings of relief, allowing four runs on six hits and three walks. Greg Larson tossed the final 1 1/3 innings, surrendering two runs (one earned) on three hits. The Drive were only able to advance one runner past second base and were 0 for 3 with runners in scoring position on the day. 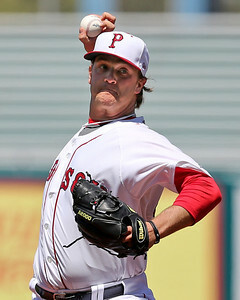 Player of the Day: Steven Wright, who had his best start of the season, hurling eight innings, while allowing just one run on five hits and striking out seven in Pawtucket's 5-3 victory over Buffalo. The 28-year-old right-hander has been struggling with the long ball recently, giving up a home run in each of his previous seven starts. Wright was also efficient Sunday, throwing 69 of his 97 pitches for strikes and not walking a batter for the first time all season.